But if we are increasingly willing to film the police, are we actually ready to do so safely and effectively? 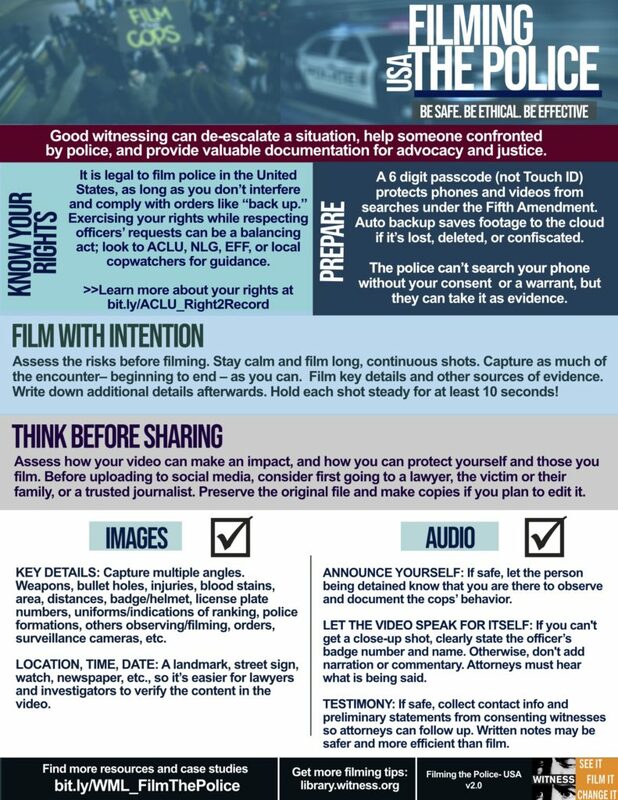 To make an impact as a witness, you need to know your rights and how to exercise them, understand how to best prepare yourself and your phone and have a plan for what you’ll do with an important photo or video after you shoot it. That’s where training and leadership from copwatchers, activist lawyers, community organizers, and others come in. We work alongside many of those leaders and have leaned heavily on their guidance and input alongside our own expertise, so we wanted to distill some of that knowledge into an accessible format. The product of that work is below – in the form of a new WITNESS tipsheet – and you can download it here. As with all our materials, this tipsheet is released under a creative commons license, so it can be reused, adapted, and borrowed from however you see fit, and we will continually refine it. On our end, this basic guidance is already being incorporated into trainings alongside more in-depth material. This article is part of a WITNESS project examining the impact of video in documenting police misconduct in the U.S. and its role in achieving justice and accountability. DISPATCH FROM BRAZIL: IF KILLED BY POLICE, GUILTY BY DEFAULT... UNLESS THERE’S VIDEO? LIVESTREAM - FROM RIO TO NYC: CAN EYEWITNESS VIDEO END IMPUNITY FOR POLICE ABUSE?